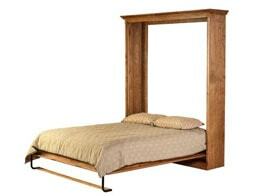 There are many different types of beds, styles, and frames including multiple sizes. Here we will briefly discuss the major 75 that are in common use today. First, what are the most popular sizes? There appears to be no standardization of bed or mattress sizes between countries, so we shall mention here the most popular sizes in the USA – which broadly coincide with those worldwide. The twin and twin XL bed sizes measure 38″ wide. The Twin is 75″ long, and the Twin XL 80″. They get their name because people often use two of each in a bedroom. They are good for children and single beds for sleepovers (children or adults). 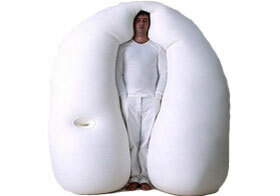 They accommodate just one person each and are good for small bedrooms or guest beds. The Full and Full XL bed sizes are 52″ wide, 15 inches wider than the twin beds. They can accommodate one adult or two children, and most people who purchase this size of bed do so for single beds for adults or single/doubles for children. It offers more wiggle room for adults and makes great single beds for children – but they can easily accommodate two young children. The Queen size measures 60″ x 80″. It is a good wide size for single adults, particularly if they are large. A Queen size bed can also be used as a guest double. It’s wide enough to accommodate partners for an overnight stay, but not generally as a permanent double bed – unless the two adults are smaller sized. The Cal King beds are a foot wider than the Queen and four inches longer. At 7 ft long, it’s a good double bed for those who are larger in terms of height. At 6 ft wide, it provides 3 ft for each partner. If partners are larger in terms of width, this 3 ft may not be enough. That is where the King is your best option. 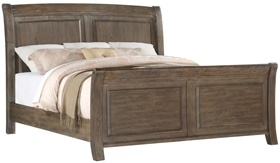 The King size bed measures 76″ x 80″. 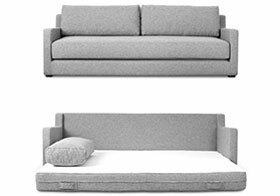 This is designed for heavier built couples who do not have the vertical height that those using a California King might have. Each partner has 3ft 2in width and 6ft 8in length. That’s twice the width and the same length as a Twin bed size. There are sizes between those above, which we refer to as hybrids. For example, the Super King/Texas King measures 80″ x 98″. This is 4 inches wider than the King and 18 inches longer. It’s also 8 inches wider than the Cal King and 14 inches longer. Not all stores may stock these alternative sizes, but they are available if you shop around. Three-quarter size beds generally measure 48″ wide by 75″ long. That’s 10 inches wider than the Twin and the same length. If you prefer a slightly wider bed for kids’ sleepovers, then this will fit the bill. These are the most popular bed sizes. 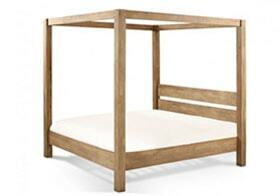 Now we continue our review of different types of beds with styles and frames. 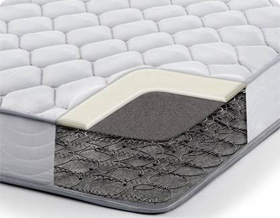 We shall begin this section by discussing the types of mattresses used in beds: the foams and other forms of support used in mattresses including innersprings and natural materials. Memory foam mattresses soften with the heat and pressure of your body. This means that you get excellent support for your pressure points: shoulders, hips, knees for side sleepers and the upper back and buttocks for back sleepers. Many people who suffer lower back and neck pain find relief when they change to a memory foam mattress, and particularly when they also use a memory foam pillow. 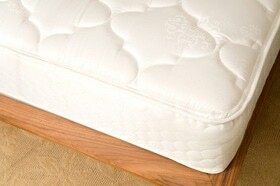 Many people like the extra support provided by springs in their mattress. It is true that an innerspring mattress can provide support, although not necessarily the directed support of memory foam. Hybrid mattresses are more popular, with a base or core of springs and a top support layer of foam: latex or memory foam. Partners find individually pocket coils to provide less motion disturbance than box springs where the springs are all interconnected. Not ALL mattresses are filled with foam or springs. There are many different natural fillings that can be used for a mattress. Goose down, feathers and even cotton are excellent fillings for a mattress. Most down is used for pillows, although a down mattress is extremely comfortable to sleep on. Other options include buckwheat haulms or hulls, while a more traditional type of filling is cotton. Waterbeds are constructed with a water-filled mattress. There are various designs, although the most popular are constructed with baffles that help to separate the relative movement of partners. Water mattresses offer a number of health benefits. They tend to be free of allergens: they are easily kept clean of dust and dust mites, bed bugs and other contaminants. A waterbed also proved excellent support for those suffering arthritis, neck pain, lower back pain, and other orthopedic conditions. Airbeds are very useful as emergency beds. If you have an air bed in a cupboard, all ready to be inflated, you can accommodate unplanned overnight stays. We have all faced this at one time or another: a friend or relative found it too late to get transport home or needed a bed for the night for other reasons. You don’t have anything available – you and your family are taking up all the bedrooms. What now? An airbed. 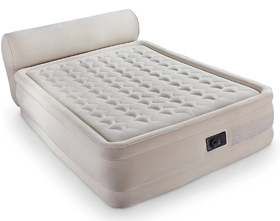 Easily inflated by mouth, hand pump or electric pump, and you have a perfectly serviceable bed. Some people prefer an air bed, although they are of most use in an emergency. Now we come to different bed types and designs. They include futons on the floor to wall beds that swing down from a wall. Sleigh bed designs and avant-guard beds of a circular or trundle design. Here is a selection of such beds that can be functional, decorative or even help prevent fights and argument – or perhaps even start them! Most ‘bed types’ are named after their looks. Ultimately, a bed is no more than a sleeping surface (e.g. mattress) supported on some type of base or frame. The name given to them relates more to the foundation than to the actual sleeping surface. We start with a traditional metal-framed bed. They consist of a rectangular metal frame holding a bed of springs for the mattress to lie on. The end board and footboard are not so much boards but made of metal as shown in the image. They are relatively inexpensive and fairly lightweight. 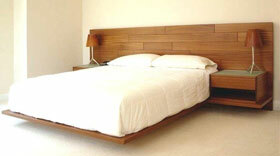 Many people find them more attractive than wooden boards, and prefer them to other bed designs. While many of the alternative bed designs shown here are used by many people as their main bed, this style is often used in a second bedroom for occasional visitors. That’s not universal since this type of design appears to appeal to many people. 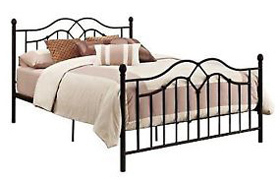 Wrought iron beds are generally heavier and more durable than any of the metal beds featured above. The scroll work displayed in the image is just of the many designs such headboards and footboards can take. 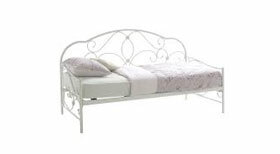 Wrought iron is very durable and such beds tend to last a long time. This material can be used to create many different intricate designs. They can accommodate most types of modern mattress, and antique or contemporary models are available according to your desire. 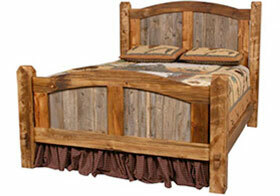 Rustic beds likely originated with the early settlers who used the wood available to fashion their furniture. This type of design was quite common in the ‘good old days’. The decoration was simple, often including a framework with fitted wooden slats forming the headboard and footboard. 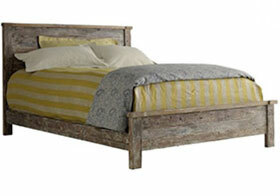 Rustic beds tend to be very sturdy and stable. They can take many different forms, although the standard rectangular shape with headboard and footboard is most common. 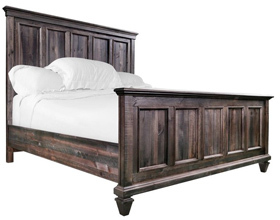 Traditional country-style beds were also made of wood with flat panel head and footboards. They were fairly simple in design, and often hand-made by the user. Some designs also featured simple posts that could be used to support drapes if needed for privacy. They are still available today, and often provide a surprisingly modern look to a bedroom. Such beds are functional, and often possess some personal features and designs that reflect the personal preferences of the craftsmen who made them. As many people have taken to sitting in their beds with their cell phones or laptops, upholstered beds have increased in popularity. The upholstered headboard makes them particularly comfortable to lie against. 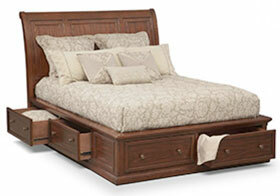 The important aspect of this type of bed is the headboard, and this model has just that – and no footboard. The frame also tends to be upholstered to present a clean appearance all around. The upholstery can be of any color, though plain self-colors are more popular than patterned designs. This style of bed developed shortly after the country style beds were popular. 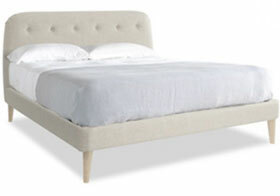 The wooden frame is generally textile covered to give the bed a comfortably soft look. They could be fitted with both a headboard and footboard, though headboard-only beds were common. The end boards were generally upholstered and buttoned to provide a rich, opulent appearance. This type of bed was designed both for its functionality and its decorative appeal. There are many different designs for such beds, but they all generally offer a look of comfort while also being upholstered in a fabric and style that complements the overall design of the bedroom. These beds appear to many people to be a bit over the top. Others see them as incredibly beautiful. This is a period style that is ornate and very distinctive. Once again, the detail is in the headboard and the footboard. They make any bedroom appear very luxurious, assuming that the same care is taken with the room furnishings as with the bed. Such beds can accommodate most modern mattresses, and there is no reason why you cannot combine such an ornate style of bed with a modern memory foam mattress and pillow. 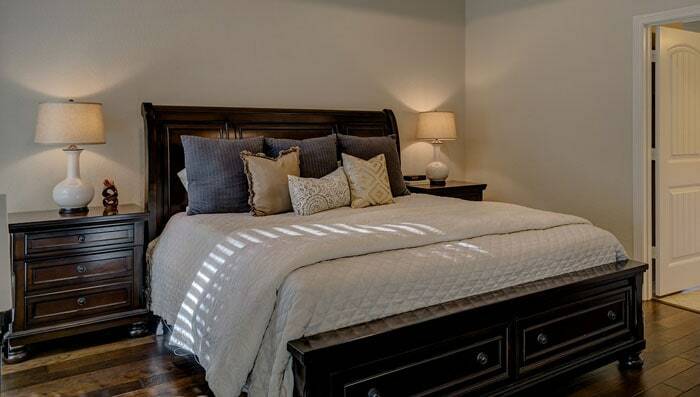 This style of bed looks best in a bedroom where the other furniture is in a similar style. 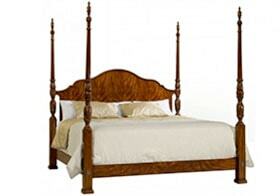 There are other types of traditional framed beds, generally with headboards but with and without footboards. Here is a selection that we believe may interest you. 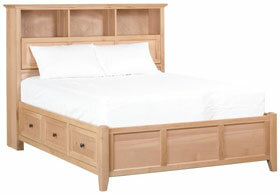 Panel beds are named after the footboard and headboard fitted to them. These boards consist of a number of rectangular panels which can be decorated or painted as you wish. There is nothing specifically novel about such beds, other than the design of the frame and end boards. You will find many different types of bed that are distinguished only by the base/foundation and headboards/footboards rather than the type of sleeping surface. 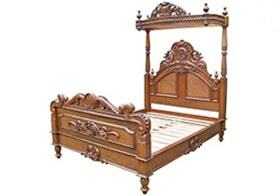 Cottage beds are known for their simplicity and their headboards, which may often be intricately carved or painted. 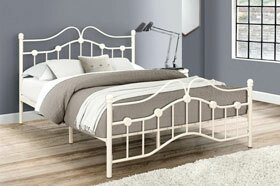 The design shown is a fairly simple one but indicates the general appeal of such beds. 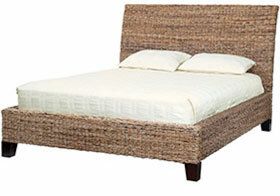 Cottage beds tend to be small since they are designed for small cottage bedrooms. They were often decorated or painted by family members. Mission beds are distinguished by the clean vertical and horizontal lines. The image below is a typical example. 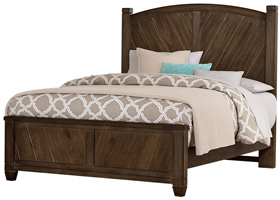 They look good in any bedroom and have increased in popularity lately. Most are stained and varnished, but they can also be painted if preferred. This style is very simple and originates from the post-war period in Europe. It is a very simple design, easy to manufacture and becoming more popular today. As you can see, it consists of a wooden frame base for the mattress and a plain wooden headboard. Although not supplied, you could easily add a footboard to this style of bed. Many people would like this type of minimalism in their bedroom. 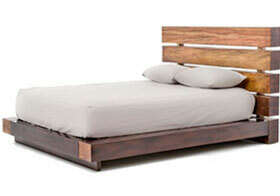 Wood is the most popular and common material for making furniture, and a bed is no different. This style of bed is still very popular. It is similar to the Retro style above, although the undersides can be used for drawer storage. This type of bed assumed increased popularity in the 1960s and 70s when its storage facilities were appreciated by those with smaller bedrooms. They were ideal for spare bedrooms since the bedding could be stored in the underbed drawers. This is now a practically universal feature in beds that can accommodate such drawers. This is just another name for wicker beds. It is hardly modern, although is becoming more popular with certain people. 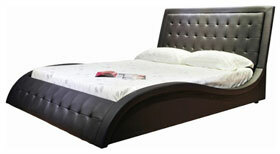 This style of bed has a certain look to it which appeals to many people. Although it may appear to look old fashioned, it is making a comeback in many areas. 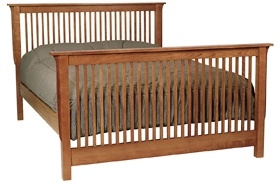 It lost some popularity to wooden panel beds because wood is easier to keep clean than wicker. Distressed furniture is an acquired taste, although many people love it. 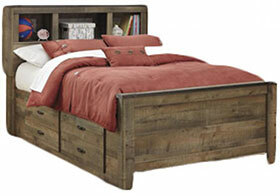 If you use distressed furniture in your bedroom, then this the ideal bed for you. They are meant to look old – that’s why they are referred to as distressed. Genuine distressed furniture is treated to look old and well-used. Some people cannot see the point in it, while others positively love it. It is the latter who can give such furniture the high prices they often command. The mattress lies over a thick platform and the headboard can be of any style, such as that displayed above. They were likely originally made at home by early settlers where the construction was fairly simple, though the bed was extremely strong. Day beds have multiple uses. They are flat surfaces where you can sit, lie down to rest, lounge on or sleep on. Most people with these beds use them in guest rooms. They are handy for unexpected sleepovers or even planned sleepovers organized by the children. While the day be featured is of a fairly simple design with a plain cover, they can be made to various designs with a variety of decorative covers. That’s all a bed needs to be known as a sleight bed: its end boards curve outwards just like the ends of a sleigh. There is no benefit from this other than its looks. Many people like the way they look – unique and unlike most other beds which may have that sameness about them. Many people prefer this simplistic look to more heavily designed beds. The one above is low, flat, offers one plain headboard and that’s it. It is primarily no more than a low base for the mattress. You can increase the height by choosing a thick mattress, or use its base for a futon or thin mattress. We shall discuss other modern bed styles later. Everybody has likely heard of a four poster bed. 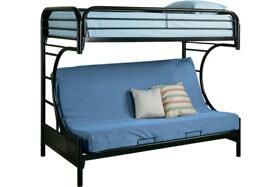 Associated with these are tester and canopy beds. Originally, such beds were designed to hold covers and curtains to ensure privacy. Newer versions of poster or tester beds are produced for their decorative properties. They can make almost any bed look good, and there are several types of which the following are good examples. Poster beds are distinguished by the vertical posts at each corner of the bed. They are a vestige of bygone days when the four posts would support a canopy over the entire bed, and curtains hanging round each of the four sides. This gave the users a degree of privacy that a modern bed cannot. There are several designs for such beds, those with a canopy is over the posts being referred to as canopy beds. This is a design that was popular in 18th century New England, and also in Europe, and gave rise to the variants shown below. 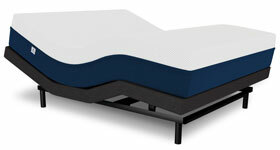 Also refer to #37: Tester Bed for more information on covered beds. The pencil poster is another type of bed that was used in larger rooms. Rather than have a bed that looked small and significant, families that could afford them would use beds such as these to indicate their wealth and status. The wooden spindles are known as finials and originally had a practical use as explained above. Latterly, they became ornamental and are still often used by those with large bedrooms. This design certainly adds appeal to a bedroom. The spindles or finials have no practical use other than their looks. There are two variants of this: the half poster and the low poster. It still looks smart and stylish, without the exclusive appearance of a pencil poster. 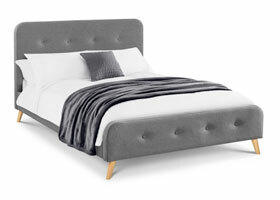 We are now discussing poster beds that are designed to look good in today’s bedrooms. While no longer able to be used for privacy (although they could with a bit of imagination) low poster beds are designed more for their aesthetic appeal than their functionality. Half poster beds come with short back posts and longer head posts. Those at the headboard are the same size as regular poster beds whilst the bottom posts are short – shorter than the low poster bed above. The posts still add elegance to the bed, and many people believe that the asymmetry adds to their appeal. Although it is possible to get smaller bed sizes, most poster beds are larger: Queen, King, and California King. Their light and relatively insignificant frame design makes it much easier to for this type of canopy bed to fit in with your current bedroom design. This type of bed can work with practically any other type of bedroom furniture, and their neutrality will suit almost any color scheme. 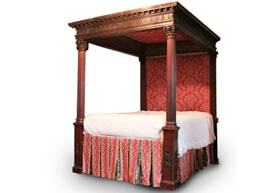 This type of canopy bed is of a more traditional style, reflecting the Regency and Victorian eras. 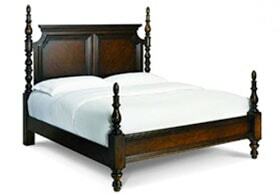 Beds were bulkier then, made from solid wood with carved and fluted posts and finials. 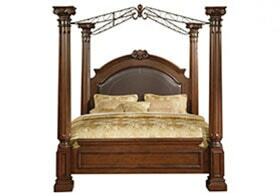 Traditional style canopy beds tend to be highly decorative with thicker posts than their contemporary equivalents. The posts are often decorated with an intricate topping as in the image above, and the sturdy posts may also form the four legs of the bed. The posts were also traditionally connected to a sturdy decorated headboard and footboard. The panel was used to hang curtains down to provide privacy to those using it. Most of this type of beds are of oak, and highly decorated with intricate carvings such as the spiral carving on the posts shown above. Tester beds are now relatively rare but can be found in stately homes and castles/palaces dating back to the 16th century and earlier. They occasionally appear at antique auctions, as do some of the other types of bed we have discussed here. A half tester bed is just what it says it is. 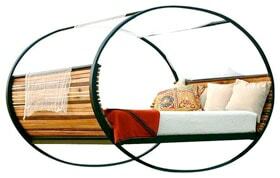 It is a poster bed that is only partially covered with a wooden canopy. They tend not to be designed with four posts as such but have two main posts at the headboard with an ornate top at that end. 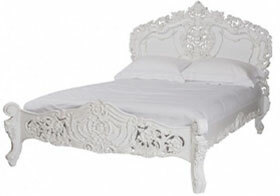 Their legs are very low, with intricately carved headboard and footboard. They were popular back in the old days when ornate was fashionable, unlike today when simplicity and clean lines are the order of the day. However, they do have their adherents who like the ornate designs of the 16th to 18th centuries. Bunk beds are usually associated with children. Many families have more kids than bedrooms, so they have to share. Bunk beds offer the best use of space in a small bedroom for more than one child – although they can also be used by adults. 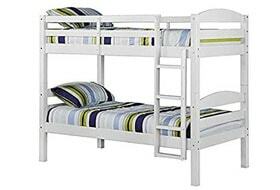 The bunk beds shown below represent the different designs of bunks beds that are commonly available. 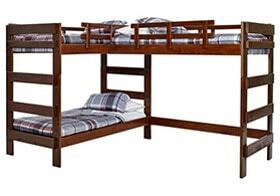 Double decker is another name for bunk beds. They are the original bunk bed design with one bed set above the other, and accessible by a ladder as in the image below. They are generally used when two children have to share a bedroom. However, as children grow older they may have a friend stay overnight for a sleepover. 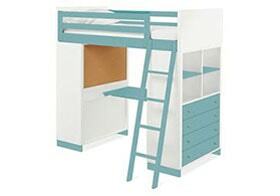 A bunk bed is an ideal solution for sleepovers in a child’s bedroom that is too small for two separate beds. There are many different designs of bunk bed available, ranging from a twin, one above the other as above, to larger sizes. The bunk bed featured here is in between, with a full size on the bottom and a twin at the top. If you don’t have much storage space in a child’s bedroom or room for a desk for your child to work at, then the loft bunk bed design would be one answer. So named because of its resemblance to the type of bed often used in a ship’s cabin, this form of bunk bed combines a bed with more extensive storage facilities than the loft bed. 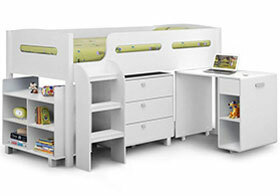 The cabin bunk bed offers various types of cupboards, drawers, shelving and cubby holes along with a work surface that can accommodate a laptop. The bed itself sits on top of it all, again with a small ladder leading up to it. Most children would love a bed such as this, incorporating plenty of storage and workspace for their homework and studying. This bunk bed design features two twin beds, one on top of the other, with space beneath the lower bed to accommodate what is known as a trundle bed. We shall feature the trundle bed below this one. 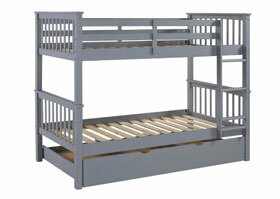 A trundle bed can be used beneath any bunk bed, or in fact any bed with sufficient space beneath it to accommodate one. This is just one example of this type of bed. They come in various sizes and woods, this example being painted white. The top tier is a bunk bed, accessible by the ladder at the right hand side while that below it can be used both as a bed and a sofa. 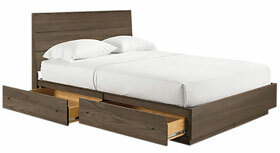 The structure is supported by a wooden frame, with the floor level space between the legs accommodating a trundle bed. This type of bed is set on castors/wheels and can be pulled out when a third bed is needed. This is a bunk bed structure that can be used by one or two people, but that also accommodates three people when needed. Trundle beds are hidden away beneath things – just like that featured above. They can be hidden inside a step up to a dual level floor; pull a handle and the bed rolls out ready for use. Due to their nature, trundle beds tend to be close to the floor. They are also handy for sleepovers – hide one underneath your regular bed, ready to roll out when needed. You can fit a trundle bed in any suitable space. They are fundamentally no more than a mattress lying on a base fitted with rollers, wheels or castors. Temporary beds are normally used only occasionally. They are usually kept for any unplanned sleepover. You may have some friends over for dinner, drinks or a party who have imbibed too much to drive home. Temporary beds are ideal for such cases. Perhaps you have an issue or accident with your regular bed – again the temporary bed comes into play. They may also be useful for friends’ sleepovers if you have young children. You might even use them for yourself if you have a small house or live in just the one room. Here is a selection of those we have found that can be used in an emergency or as your main bed. 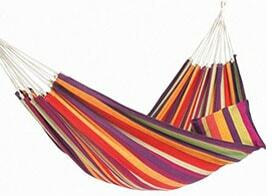 Hammocks are likely one of the best known of temporary beds. Used by the navy for centuries, this type of bed can be strung up when needed and folded away when not. All you need are two posts, poles, trees or any other structure to support both ends. 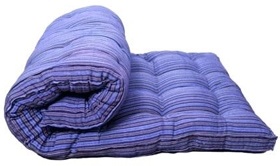 These are the ultimate in temporary bedding and normally used by civilians in the garden or when camping. They can also be used as an emergency bed when there is no other alternative. Folding beds are alternatively known as sofa beds or bed settees. They are sofas during the day and can be folded out to a bed at night. Many people use folding beds like this as an emergency bed for overnight guests. They are easily converted into a bed. While such beds may not be the most comfortable, they are functional and good for one or two overnight stays. 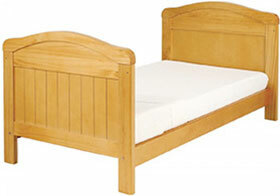 In fact, many people who live in bedsits or one room use this as their main bed. Sofa by day, bed by night. This is another type of sofa bed, only it doesn’t fold out. This type of sofa bed has a futon built into the couch. You can pull the futon out when needed in case of unexpected guests. In fact, you could use it as your own regular bed/futon if you live in cramped quarters. 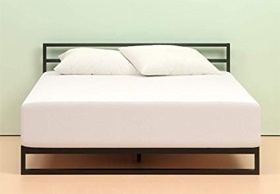 It is yet another example of an emergency bed that is comfortable enough to be used as your regular bed – particularly for young single people. Just like the temporary beds above, these are ideal for unexpected guests – or even for expected guests who need to stay overnight. 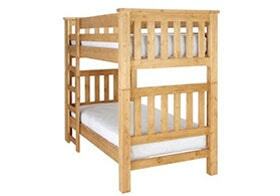 Cot beds are basic, can accommodate a single adult, and can be folded up and stored away until next needed. Some people have two or three of these stored away in a cupboard in case they are needed. 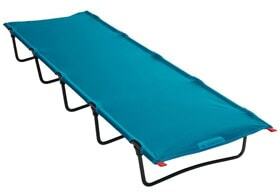 Designed fundamentally for camping, camp beds are temporary beds that can be folded up and are light to carry. The can fold up into a very small size, and are easily attached to a rucksack. Many enable you to use nothing more than a sleeping bag on them, although in many other cases a rolled up piece of foam would be a more comfortable base for your sleeping bag when laid over the camp bed. 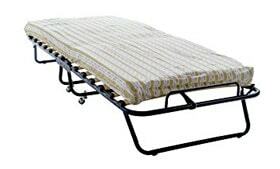 This type of bed is generally used only when camping, particularly when you are hiking with no motorized transport. This type of bed is another type of furniture that is a sofa by day and a bed by night. When needed, the sofa folds out into a bed. You can get versions that pull out into a Queen or King size bed. You can get other versions that fold out into a bunk bed: your couch can be converted into two bunk beds. That’s pretty cool in anybody’s language! You have visitors with two children – you have only one spare bedroom. The adults get the spare room, and you can pull out the couch to create two bunk beds for the kids. 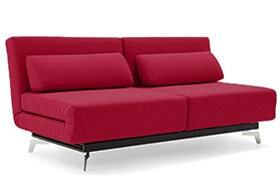 Similar to the pull-out couches or sofas above, this futon couch can be used as a bed when needed. There many different designs of this type of bed that provides a double use in a small room. A couch by day and a futon by night. It is fundamentally a bed and a sofa in one and can be used either in an emergency, or as your main bed if you live in a small property. A futon bunk bed combines the concept of a regular bunk with a futon. As you can see, it combines the benefits of a futon with a bunk bed. The ladder is at the back. 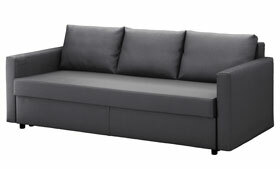 You can use this predominantly as a couch with a bed on top, or as a futon and bunk bed providing two sleeping spaces. This option may appeal to anyone living in a single room or with limited sleeping space: it provides a spare bed for any occasional visitor. Beds can be of many designs, and in this section, we present a selection of those we have found that are unusual, to say the least. Many appear very uncomfortable and designed just for design sake – not for comfort while you sleep, assume you can sleep in them. This type of bed was originally designed for the Japanese, whose minimalist space-saving approach to furniture results in furniture being used to its maximum potential. Some refer to this as a ‘book bed’ but books are just a small aspect of the use to which this type of bed may be put. The Japanese have traditionally lived in small houses. This is said to be due largely to the risk of earthquakes in the country. It’s also the same reason why Japanese houses are made of paper and wood, rather than bricks and mortar. It can be used to store books and other items. This can be used as a normal bed, but when it is closed it can be used as a mat for children playing on. This is simply a bed with lighting included in its construction. 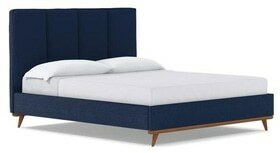 The example here features blue LED lighting in the headboard. There are many other types of ‘lighted bed’ although in many, the lighting has no practical use. It is used simply as a design feature. There is no specific bed type that lighting is used on – you can install your own lighting on your existing bed if you want to jazz it up a bit. 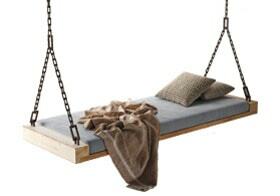 This bed will suit you if you like to be rocked to sleep in a rocking chair. Even if you have never used a ro0cking chair, you can test one of these – if you can find a store that sells one! The bed is set in a round framework. When you push it down or rock your body back and forth, then it will start rocking. 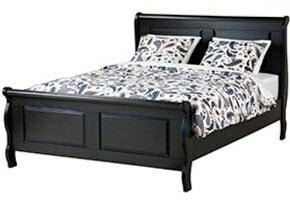 Most of those that use this type of bed find it very relaxing, and can help them easily get to sleep. However, not everybody likes the rocking sensation, so don’t use this if it makes you feel sick. 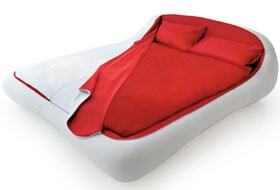 This bed zips down to let you in, and you can zip it up again when you get up in the morning. You can leave making the bed until night time again. Simply zip it up after you rise. When you go to this bed, simply lie back, relax and fall asleep. The bed (if you can call it that) holds you in so you don’t fall out and supports you while you sleep. Perhaps you would need to try this ‘bed’ out before actually paying for it! Who knows: it might very well be extremely comfortable, but where do you put your book when it’s time for lights out – and how do you get to the lights? This bed is not floating in the water. If it was, how would you get to it, and where would the water come from? 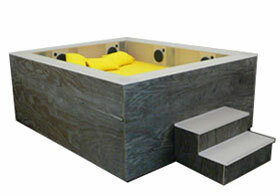 Your bath would be a bit narrow for a floating bed! There is actually no water involved. This bed floats in the opposing magnetic fields of two magnets. The magnets are very strong and can support up to 900Kg of weight (1984 Lb). Does the 1984 have any significance? It did to George Orwell’s novel of the future. Perhaps this will be the bed of the future – who knows! The sonic bed helps you to sleep using music (hence ‘sonic’) The Sonic Bed is fitted with a portable sound unit that is programmed to play music while you fall asleep, and also when you are sleeping. If you sleep better with music in your ears, then this is the answer to sleeplessness. Why you can’t just play your radio is immaterial – this solves a problem many people have. They need music, not only to help them get to sleep but also to have a more satisfying, restful sleep. This bed is immersed in a pool of sound – soft music or even soporific sounds such as bird calls or waves breaking gently on a shore. His bed is styled in the form of a wave, a design that many people find attractive. 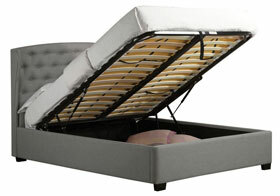 The frame easily holds a Queen or King Size mattress, and the space beneath the bed can be used for storage. 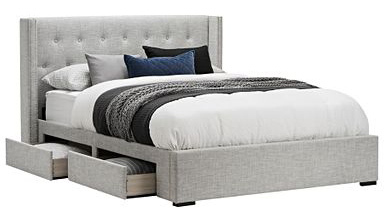 It can also be used in a bedroom as a unique feature, even though it is a genuinely functional bed. They can be used as fun beds for older children, or in the garden or patio on warm summer nights. Some designs are attached to the wall at one end, and suspended on ropes or chain at the other. 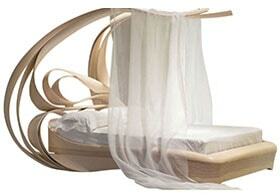 The Enignum bed is based upon young designer Joseph Walsh’s Enignum series of furniture. This bed is a typical example of his type of work. The term Enignum is taken from the Latin terms for mystery (enigma) and wood (lignum). 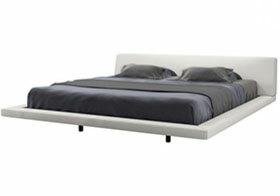 It is very fluid design without the angularity normally associated with bed designs. This design projects both protection for and embracing of the sleeper. It is a beautiful style of bed to look at and can be fitted with drapes or netting to provide a good level of privacy. 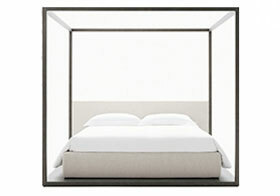 The hinged top lifts up to reveal a Queen Size bed on a steel foundation. There are many different versions of this type of bed. Some can be concealed within a cupboard to fold down into bed, while others can be pulled out from the wall. This concealed bed video shows how that is done. 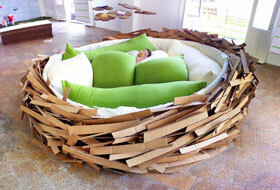 The birds nest bed is a modern bed design that people can use as something different to impress their visitors. It looks just like a large bird’s nest. It is immensely comfortable to sleep in and is certainly a must-have design feature that your visitors will want. Be prepared to be asked where you bought it, when you can be truthful or say you forgot – or that it was a gift! We finish off with some miscellaneous bed styles that many people like. Some of these are unusual while others are fairly common – or were back in the day. They are often given a name that reflects their looks, functionality or era. This type of Ottoman bed comes in single and twin sizes and is ideal for a sleepover or emergency bed for unexpected guests. Like many such ‘instant beds’ the Ottoman bed is also handy for use in bedsits and student accommodation. It comes with drawers each side of the bed and at the bottom. Some of these beds also incorporate storage shelves into the headboard. There is nothing special about them other than helping you save storage space in your bedroom. It is particularly useful for smaller homes. You can keep your favorite books there, or those you have still to read. Many people like reading in bed before lights out, and it should not be difficult to fit a light switch to this type of headboard. It’s ideal if you have a small bedroom with insufficient room for a nightstand. Some shelves for books and others for anything else you want by you when you sleep. 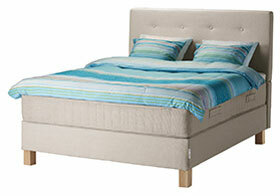 Adjustable beds are popular, particularly with those who, for medical reasons, spend a lot of time in bed. 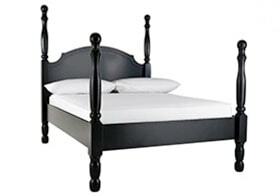 There are many different types of adjustable bed, though they generally rely on an adjustable frame and a mattress that is suitable for bending. The frame is set into the structure of the bed. 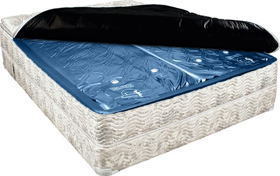 Suitable mattresses include latex and memory foams, though innersprings do not work well with this type of bed. You can adjust these beds into a range of positions, with both the head and foot area having its own adjustments. They operate by means of electric motors operated either by a remote handset or a controller hard-wired to the bed. This type of bed would look great in a bedroom decorated and furnished in an old fashioned way. 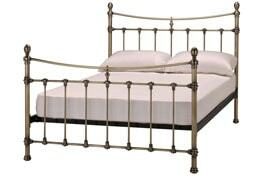 The frame displayed above is just one example of many different styles of brass bedstead. You can find many alternatives in antique shops if you prefer the genuine article to a modern rendition. This one sleeps three, but could easily be made to fit four children if there was an additional bottom bunk. Alternatively, that space below could be used for a desk and chair or a small storage unit. This design makes the best use of space and is great for two children of roughly the same age, with a spare for a sleepover. This Murphy bed can fit into a wall. It can either be attached to a wall, or the wall chased out to the necessary depth to accommodate the frame. 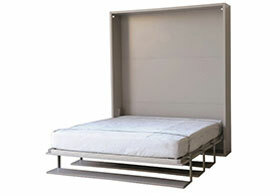 This is an ideal solution for a small bedroom, a bedsit or other accommodation with limited sleeping capacity. The mattress will fit into the frame and unfold with the bed. This type of bed is not much different to others we have reviewed. A divan is fundamentally a bed where the mattress is incorporated into the structure of the bed rather than a separate entity. A divan need not have a headboard and does not have a footboard. Strictly, it is a large wide sofa that is designed for sleeping on. 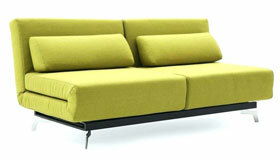 It is often used by people with limited space in their home, where their sofa doubles as a bed. Some divans have drawer fitted to make the best use of the storage space available. The last of our 75 different types of bed! How many of us have never crashed out on somebody’s floor after a party – or even during it! The floor is not a recommended sleeping surface, but it is good in an emergency. We have no need of a photograph of a floor, because we all know what it generally looks like – a spacious flat surface, hopefully carpeted, that is easy to get to after a party, but often not so easy to get up from! At least not on the same night! These are the 75 different types of beds we have found to be available to buy. Some are well known, others not so. Some may surprise you with the ingenuity of their design, while others have been standard stalwarts for decades. No matter which of these types of bed interest or attract you, never4 lose sight of what they are for. Beds are for sleeping on, and as such should be comfortable. Sure, some of the more temporary beds such as camp beds may not be as comfortable as your main bed at home. However, you are sure to have discovered that there are bed designs that you have never come across before. Maybe one of these will attract you, who knows? If what we have provided interests you, then will have done our job!